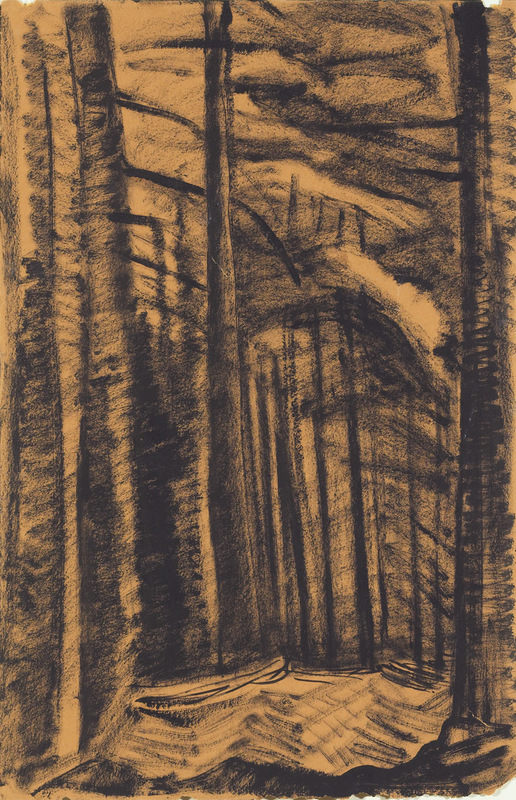 Emily Carr (Canadian, 1871 – 1945), British Columbia Forest, c. 1940, oil on paper mounted on hardboard. Collection of the Toronto District School Board. Acquired by Central Commerce Collegiate Institute. 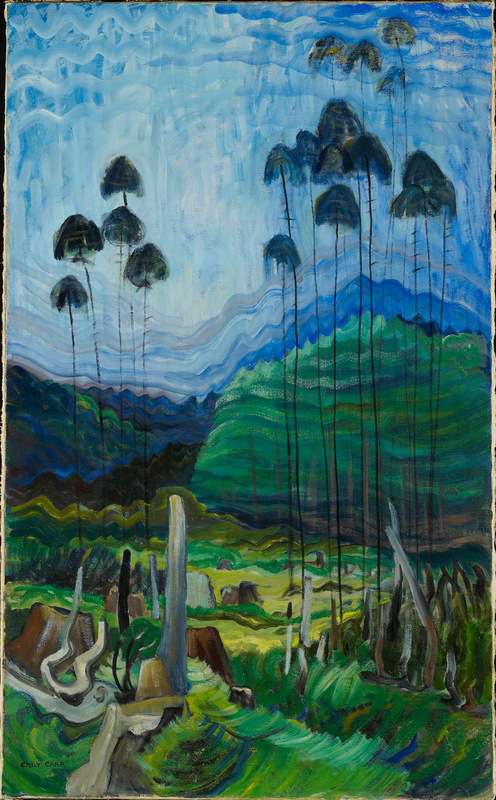 Emily Carr spent most of her life in British Columbia. Her family led a conservative English life in Victoria. Carr was known throughout her life for her independent, rebellious and sometimes abrasive personality. In her biography, she recounted a time from childhood when she caused a scene at church by kicking at the minister and later playing in the mud in her Sunday best. She displayed an interest and ability in drawing early in her life. 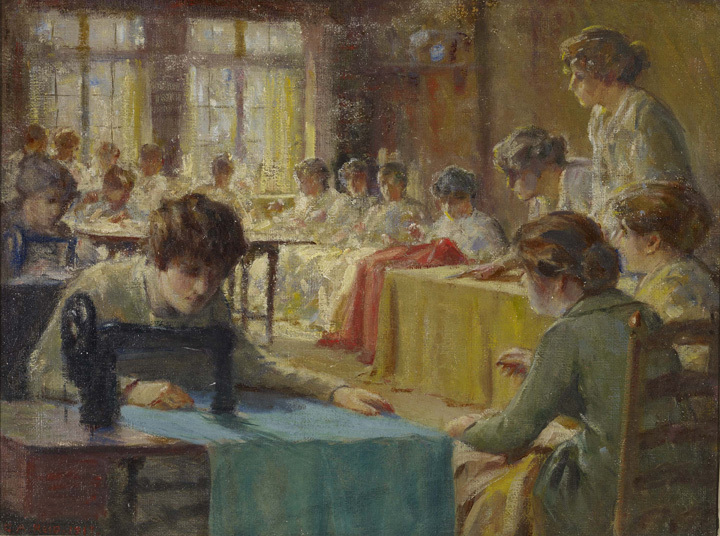 After her father’s death when she was 17, Carr went against the wishes of her older sister and decided to study art in San Francisco. In order to raise money to study drawing and painting in Europe she gave art lessons in Victoria . While in England, her health deteriorated due to anaemia and she had to be hospitalized for 18 months. For companionship, the doctors allowed her to raise three baby birds by her bedside. Once she recovered, Carr travelled to France to learn about “The New Art” movement sweeping Europe in 1910, characterized by bold colours and visible brush strokes of the post-impressionists and fauvists. Two of the pieces she painted in France, Brittany Landscape and Autumn in France were accepted by the Salon d’Automne in Paris and exhibited with works by Matisse, Vlaminck and others. To view the work of Matisse and other French painters of the early 1900's visit the Barnes Foundation. Upon her return to BC in 1912, she organized an exhibition of her work created in Paris, which met with mixed reaction from critics. 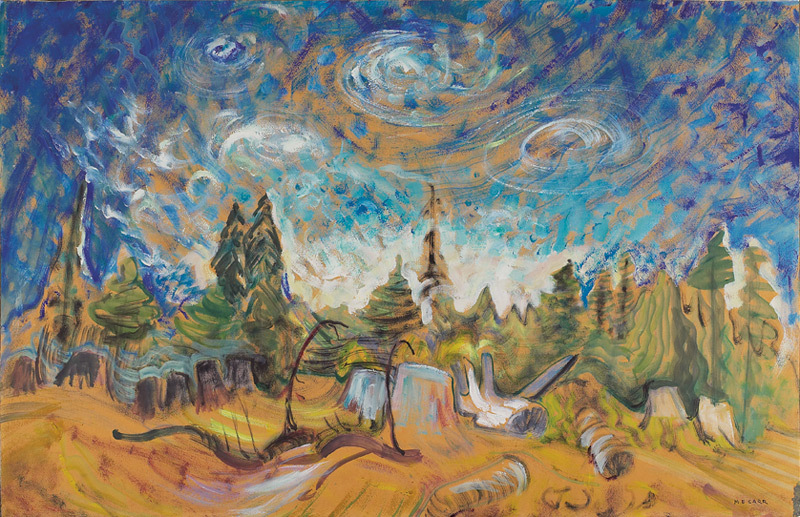 Shortly after, Carr set off on a solo expedition into the wilderness to capture her perception of B.C.’s First Nations culture and peoples through painting. She brought her painting supplies, blankets, and food. A logging boat took her to several Haida villages. In two months, she painted over 200 pieces. 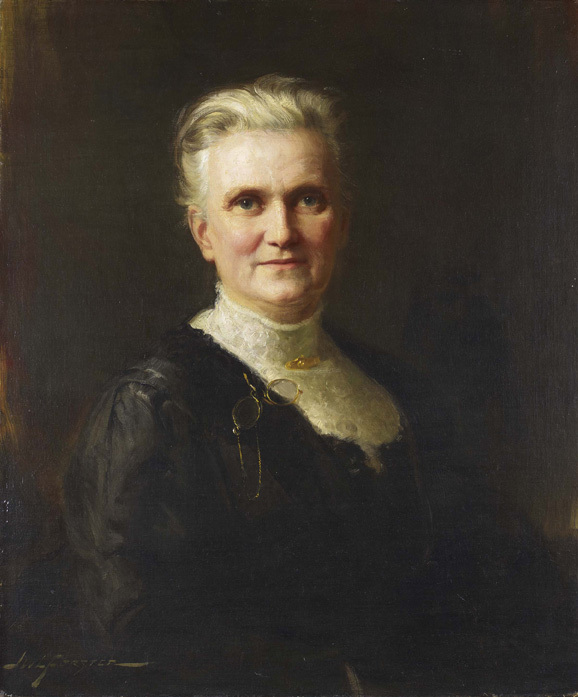 In 1913, Carr submitted a proposal to the provincial government to display her paintings in the new wing of the Parliament Buildings. They rejected her proposal, as the paintings did not portray a photographic image of First Nations people, life, and culture. Undeterred, she mounted her own exhibition, which was met with criticism. Visitors expected a perfectly reproduced image, not paintings that attempted to express the spirit of the First Nations villages as seen by Carr. This time, the public’s criticism of her work had a negative influence on her. 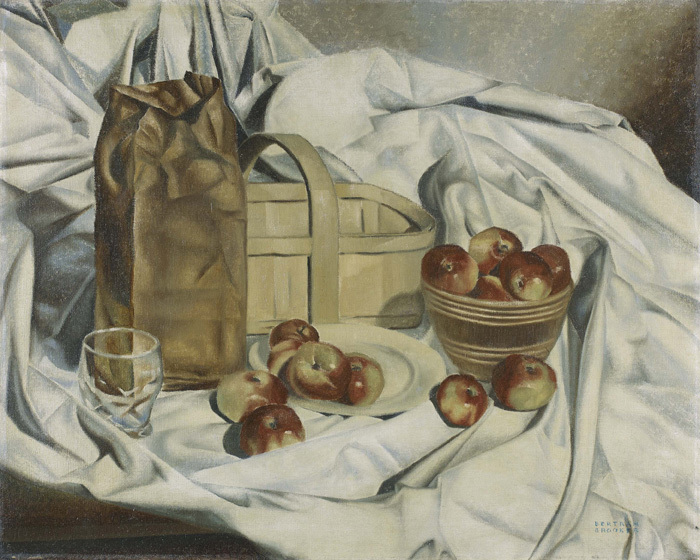 Carr would not paint for another 14 years. From 1913 to 1927, Carr made ends meet by running a rooming house and breeding dogs. 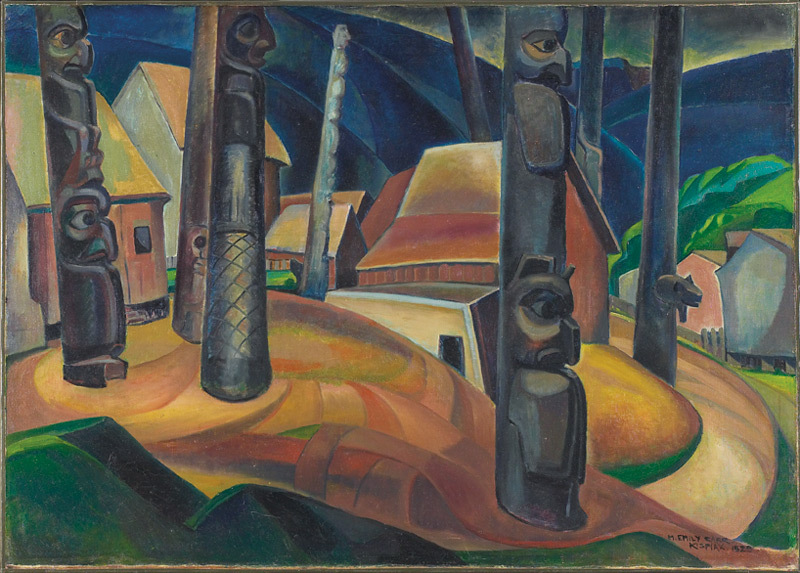 In 1927, Marius Barbeau, Director of the National Museum in Ottawa heard of Carr’s work from a Tsimshian interpreter and invited her to exhibit some of her paintings at the Exhibition of Northwest Coast Art in Ottawa. She met many artists and returned to Victoria renewed. At 57 years of age, Carr went into the B.C. forest again, this time going deeper into Skeena and Nass to paint the First Nations territories. 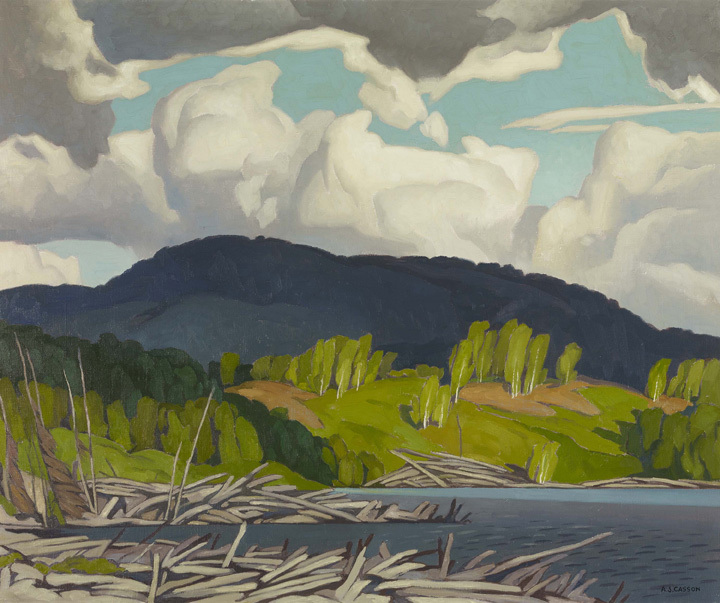 In the early 1930’s, influenced by The Group of Seven member Lawren Harris, Carr decided to turn her attention to the natural landscape, and leave First Nations motifs behind. In 1933, she purchased a modest trailer she called the Elephant. With it she took numerous sketching trips to the shores and wooded areas on Vancouver Island and created her signature landscapes. 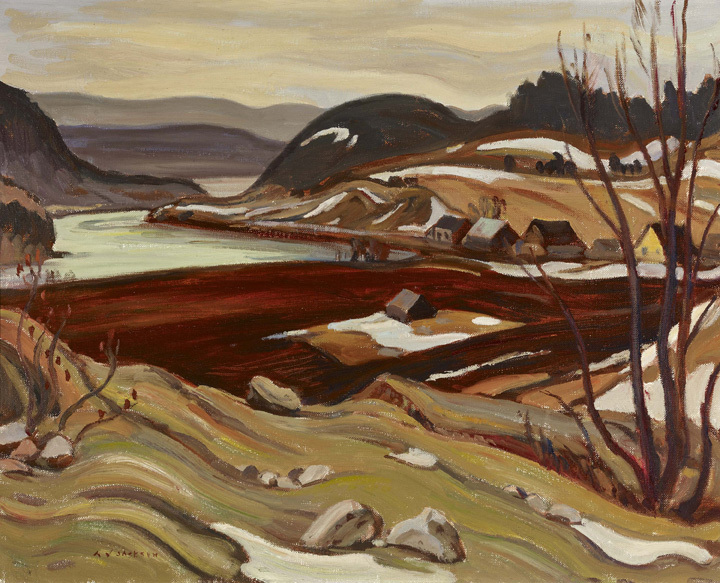 By 1935 Carr had become one of Canada’s most celebrated artists. She also won the Governor Generals Award for writing in 1941. Her short stories, cartoons, and autobiography became almost as famous as her paintings. Carr enjoyed a few short years of public recognition, prior to her death in Victoria in 1945. After her death, Lawren Harris wanted to ensure her work was appropriately represented. He was instrumental in the selection of her work for The Vancouver Art Gallery and other large Canadian institutions. By 1940, Carr had travelled in her caravan to many of Victoria’s surrounding forests and shores. She made hundreds of pencil, charcoal and paint sketches while on these trips, with the intention of turning many of them into larger, more detailed paintings back in her Victoria studio. This painting shows Carr’s interest in portraying light, and the sky surrounding the trees. There is a spiritual quality to the light in this painting, one that can be seen in many Lawren Harris paintings from the same time. Carr and Harris were good friends, and they often wrote letters discussing their art, and the philosophical approaches to their work. 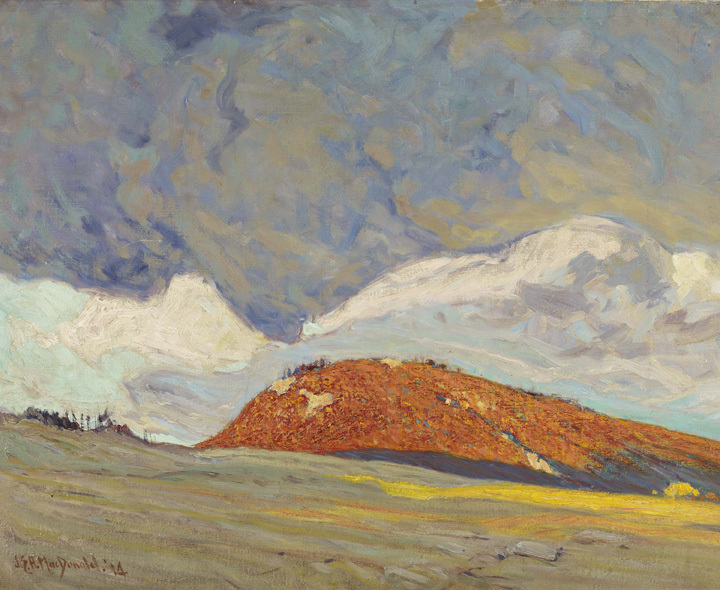 Unlike Harris, who found inspiration in artist collectives like the Group of Seven and the transcendental painters of New Mexico, Carr rejected all groups and organized religions. Carr’s early work was inspired by the bold, bright paintings she saw in Europe during her studies, and the villages surrounding her Victoria home. 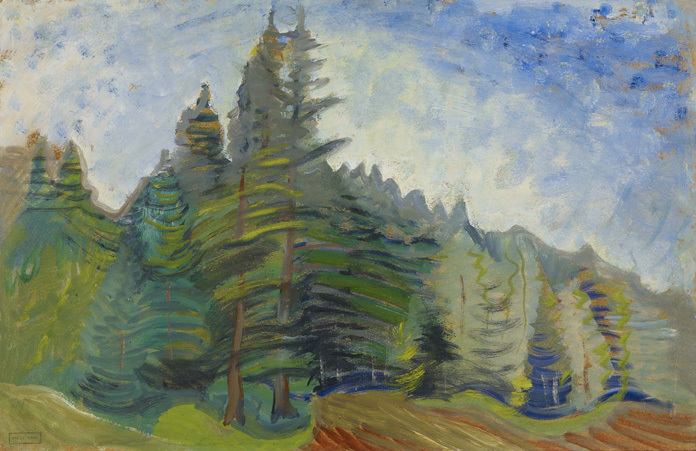 After experimenting with bright and warm hues of red, orange and yellow, Carr said that she could not go back to the “old dead way of working after I have tasted the joys of the new.” This “new way” of seeing was inspired by what she saw in First Nations villages, and in the brightly coloured artwork of the post-impressionist and fauvist painters she saw in Paris. She later moved on from these bright colours to a more subdued pallet. Later in life Carr chose deep greens for her lush forest landscapes and bright blues to depict expansive skies. 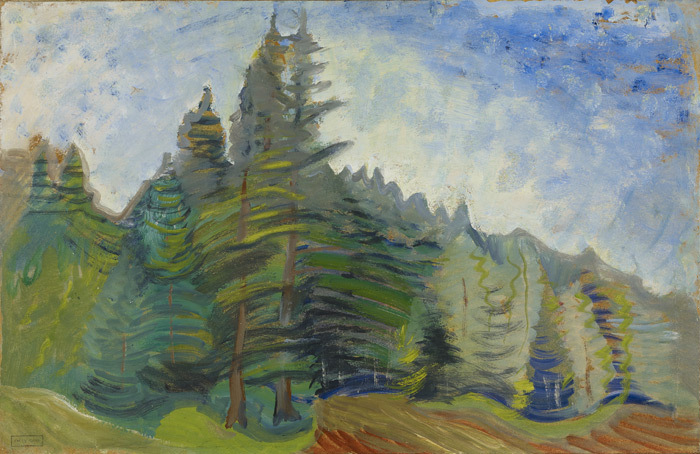 Emily Carr found inspiration in the diverse landscapes of B.C. and in the First Nations villages, artwork, and people. She always felt like an outsider, separated from the rest of Victorian society but she identified with what she presumed to be the First Nations’ “free” way of life and harmonious relationship with nature. Carr enjoyed being outdoors, working on her sketches in the villages where she travelled. 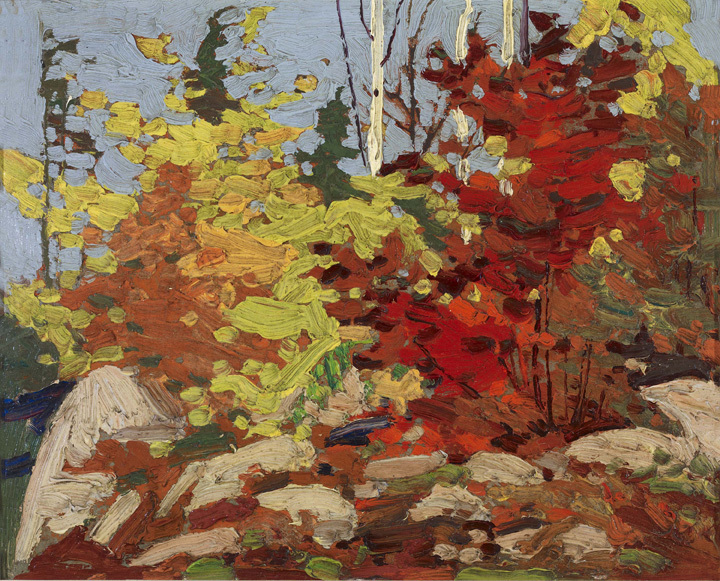 In 1928 Carr became friends with the Canadian painters who made up The Group of Seven. She was influenced by their work, and she equally influenced them. She developed a lifelong friendship with Lawren Harris, who wrote to her often and encouraged her work. 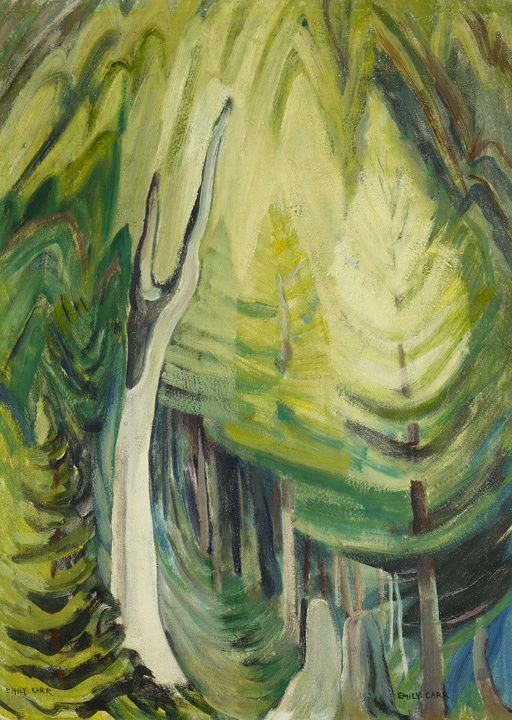 Later in life, Carr began painting the BC forests as she felt that painting totem poles and other Native art was copying the work of someone else and didn’t truly belong to her. Although Carr was inspired by the outdoors, she was not considered an environmentalist. She worked in old growth forests, areas that had been logged, and second-generation industrial forests. She was aware of the power of nature and the cycles of natural growth. Despite industrial logging on Vancouver Island, she felt that nature would always sustain and renew itself. Today, we are more aware of the irreversibility of human intervention. 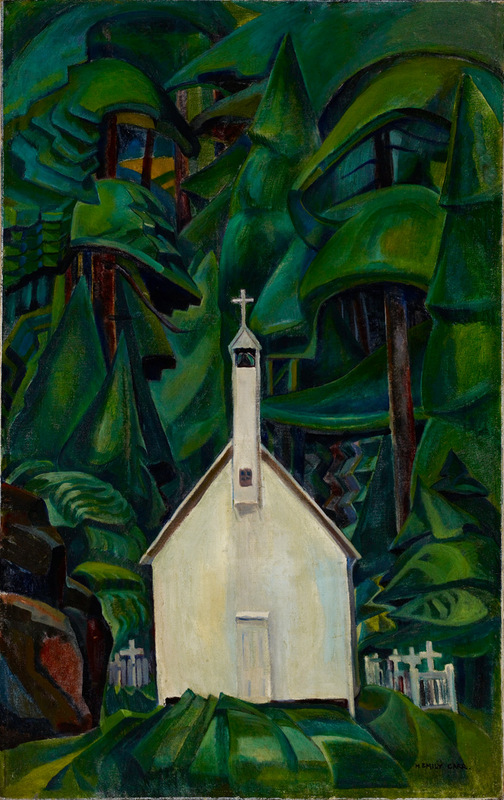 In 1928, Carr’s painting Indian Church was exhibited at The Art Gallery of Toronto (now the AGO). 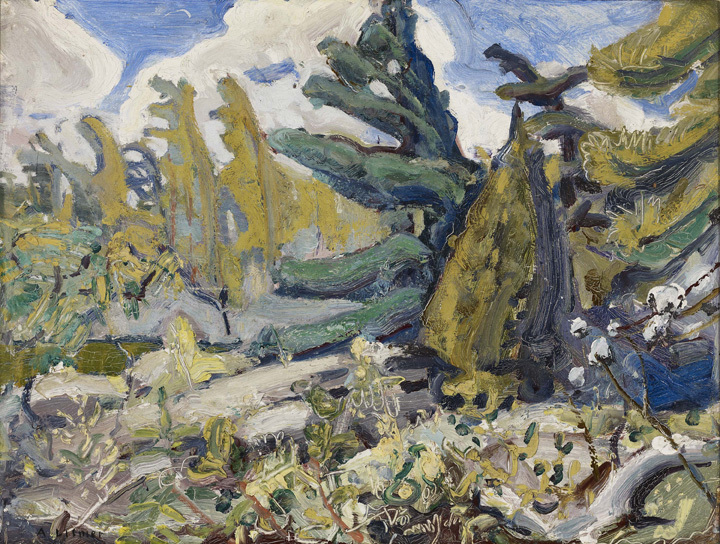 She travelled to Toronto for the exhibition, and it is here that she met the Group of Seven. 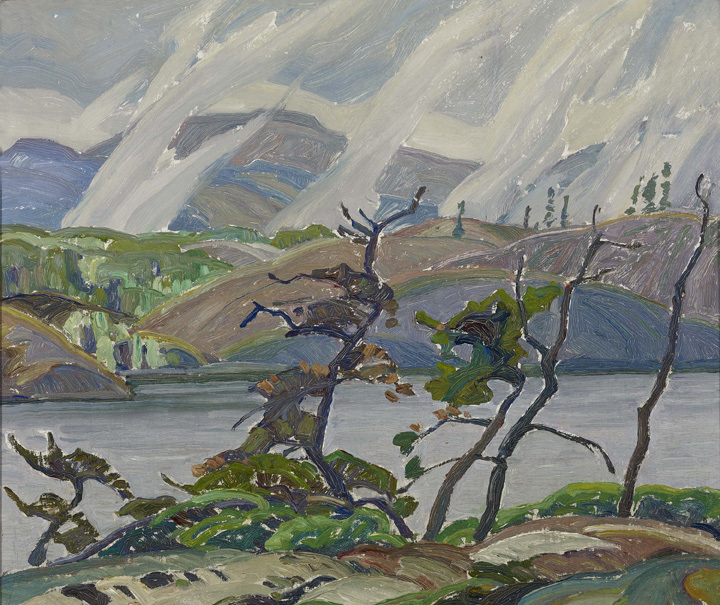 Lawren Harris, a principle member of the group purchased Carr’s painting as he felt that it was one of her most successful works to date. Harris also invited her to the Group’s Toronto studio, introduced her to the other members, and showed her their work. The studio built by Harris still stands today near Toronto’s Rosedale subway station. Carr’s painting, Indian Church is now part of the AGO’s permanent collection and is currently on display. 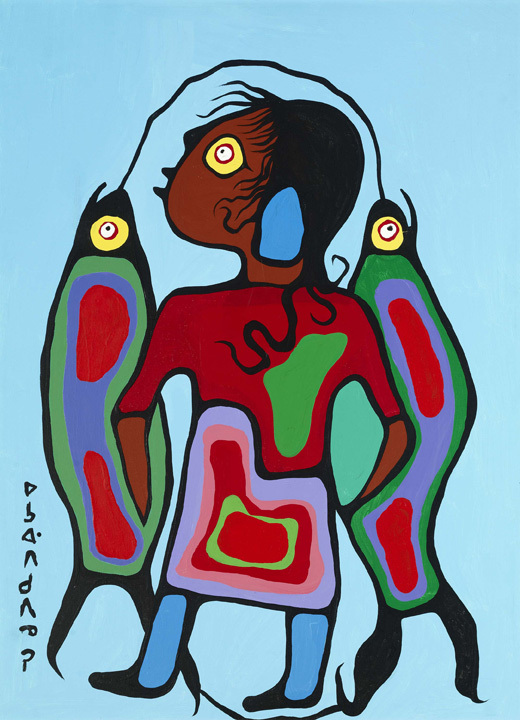 Although the word “Indian” has been replaced by the terms Aboriginal or First Nations, the title of the painting remains as Carr intended. 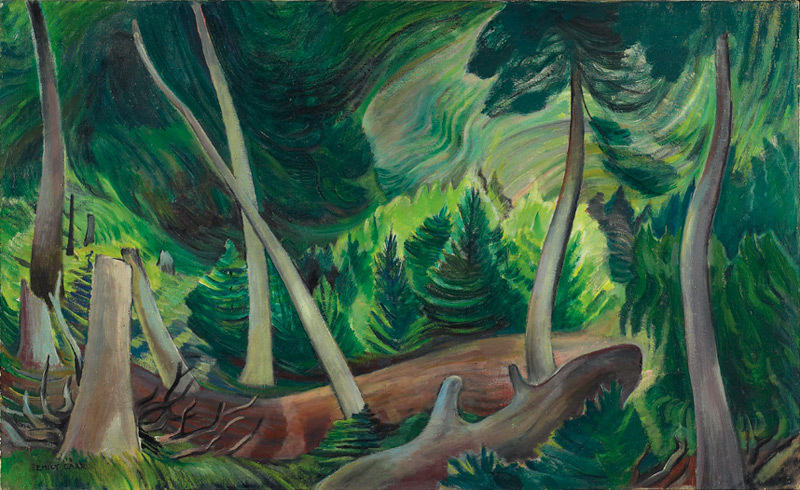 A number of Carr’s paintings of forests, totems, and First Nations villages are part of the AGO’s permanent collection. Q1. What is happening in this work? What do you see, smell, taste, touch, and hear when you examine the work using your five senses? A1. Students should be able to connect to the work using their five senses. Ask students to point out the specific areas of the picture connected to their sensory response. Q2. What do you think is the theme or subject of the work? Why? What message or meaning do you think the work communicates? A2. Carr was deeply connected to the forests Vancouver Island. Her pictures often capture the peace, beauty, and grandeur of the forest. 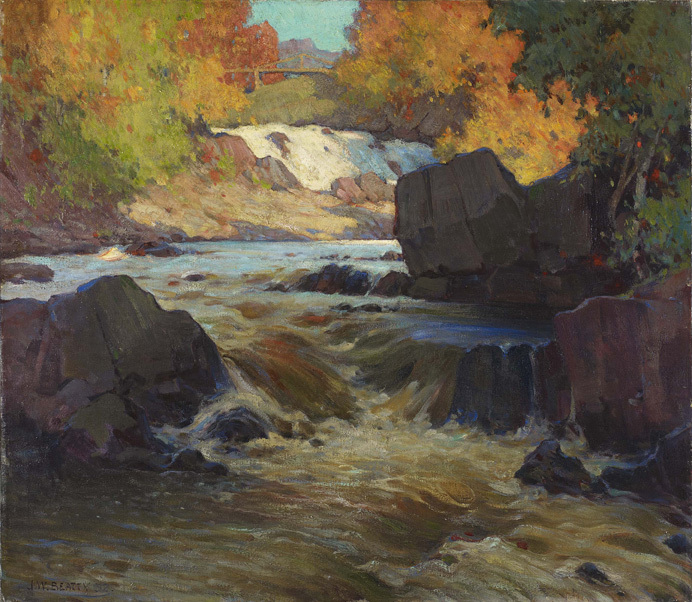 In this painting, Carr steps back to reveal the sky, which seems to create a glow or halo around the trees. Discuss how this new perspective impacts the message and meaning. Q1. Great works of art don’t just happen on the first try. They are often the product of a long creative process that includes: inspiration, experimentation, planning and revising. Look at some of Carr’s preliminary drawings and paint sketches. What visual ideas do you think Carr was experimenting with? Compared to similar finished pieces, how do these ideas evolve into more complex and complete paintings? Over a period of several days, pick an area of focus for your own drawing and painting work. Begin by carefully observing space, objects, or the natural environment. Think about the subjects and issues you are interested in, such as the environment, waste, or an issue in your community. Pick a subject that clearly illustrates this issue, and determine how you would like to portray it using sketches to experiment with ideas. Start working in pencil or charcoal and gradually move to coloured pencil, pastel, or paint. View, and discuss your sketches over several days, and complete more sketches after each conversation. Try to make decisions about what you would like to try, and ideas you would like to push forward, like a “plan of creative action”!